Most Americans assume a progressive tax code is needed to promote equality and remove some of the burden of other taxes on those with the lowest income. But the progressive nature of the tax code changes behavior in many ways. As a result a progressive tax code is economically destructive. To start with an obvious example, let’s assume the tax rates on a business start at 10% and after a certain point reach 100%. How much money would be collected at the 100% rate? The answer, of course, is zero. No business would bother earning more money only to be obligated to give it all to the government. Many statistics would hide this change of behavior. The average tax rate on businesses would seem a low 10%. But decisions are not made at the average. They are made at the marginal rate. 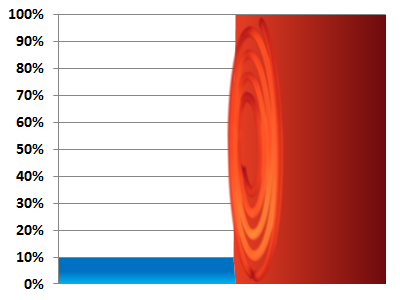 When your hand first touches a hot stove, your average body temperature is still normal. Nevertheless you recoil quickly. Increasing marginal rates are like a hot stove to additional productivity. Businesses are like rich people. They can decide how much income they want to realize each year. Capping the income of otherwise productive companies is economically destructive. Not only does it restrict productivity and the creation of wealth, but it also limits employment and taxes paid. Imagine there is a proposal for a flat 20% tax. Liberals rage that would mean doubling the tax on the poor businesses while giving Big Greed an 80% tax cut. But what is the effect? Businesses that would have truncated their earnings no longer hold back. Productivity jumps and unemployment drops. All this while the tax collected could more than double. Now that an obvious case has established the concept, let’s look at smaller tax progressions. Remember that all economic decisions are made at the margin. There has to be a decision, and we have to look at the marginal tax change. One such decision is how much money you should convert from a traditional IRA to a Roth IRA each year. The more you convert in one year, the higher the tax bracket you get pushed into. Waiting until next year to convert the money is always an option, especially because you can decide to unconvert, or recharacterize, the money any time before you file your taxes. Getting pushed into a higher tax bracket sets up a hurdle that the conversion account must appreciate before keeping the conversion makes financial sense. Some of the hurdles are extremely high, even at very low incomes. Suppose you earn less than $17,400 and are in the lowest tax bracket of 10%. If you convert $100 from a traditional IRA to a Roth IRA, you will owe $10 more in federal tax. But if another $100 pushes you into the 15% tax bracket, you would owe $15 in tax. If you could wait until next year to convert at the 10% rate again, when would it be advantageous to convert this year even if it pushes you into the 15% bracket? In other words, what is the hurdle of added productivity you must surpass to overcome this minor increase in the marginal tax rate? It turns out the hurdle is a 50% annual return on your money. Unless your $100 grows to $150, you would pay less tax waiting until next year and converting at the lower rate. Ten percent of $150 next year is equivalent to 15% of $100 this year. Those who favor a progressive tax system do not realize that a small increment of 10% to 15% can truncate any decision to be more productive unless you have a good chance of earning more than 50% over the next year. If you think the poor can’t or don’t make such decisions, you are mostly wrong. The poor fear dropping off entitlement cliffs more than they do hitting the wall of higher taxes. And a vague perception of the effects causes most to err on the side of avoiding paying taxes or jeopardizing their benefits. There are places where it can cost you multiple dollars of benefit for every additional dollar you earn. The middle class and wealthy have even more discretion over the timing and amount of their income. We encountered such a case recently: clients with a base income of about $69,000 for whom we were considering a Roth conversion. Our federal Roth calculator computed they should convert up to the top of the 28% tax bracket, an additional $143,000 so long as their Roth account had not lost money. This would have resulted in the federal government receiving an additional $38,000 in tax revenue. The hitch was that these clients live in California. Virginia state taxes reach their maximum after only $17,000 of income. Beyond that point the rate is a flat 5.75%. But California tax rates are highly progressive, with rates from 1% all the way up to 10.3% for income over $1 million. In our clients’ case, realizing this additional income would push them from the 6% state bracket to 9.3%. The hurdle for this marginal tax increase is a 55% annual return. A hundred dollars taxed at 9.3% this year is equivalent to $155 taxed at 6% next year. The effect is that neither the federal government nor California will be collecting that additional tax this year or ever. A progressive tax code discourages productivity, actually rewarding you for producing less. This system destroys much growth in the economy that would flourish otherwise. Purposefully doing this simply so the rich have less is evil, and it hurts society as a whole. Listen in political debates when the term “rich” is used with emotions that make it almost an economic slur. Our current system is complex enough to create many entitlement cliffs and marginal tax walls throughout the income spectrum. Tax simplification would eliminate many of these barriers to economic mobility and encourage greater productivity across the board. And one of these changes is a flatter tax and fewer deductions. Lower Taxes, Fewer Deductions: Are Romney and Ryan Dodging the Specifics? I like the argument, John. The only thing that sticks out is that entrepreneurs and people who are really driven to succeed in the world won’t hold back on their ambitions because of taxes. Someone like Steve Jobs isn’t going to go back to college to become a Law professor and move out of the garage from starting Apple in order to avoid taxes. It’s kind of an afterthought, especially for the middle class. This is unfortunate, because it exploits human productivity for government expansion/revenue. We work with a number of small business owners. And you are correct, they have a drive to excel. But I have seen that they too have limits of diminishing returns and this administration and this economic environment has had an effect. Some of them are facing tax increases of $300,000 for next year causing them to question why they are slaving for government largess. Remember that financial success may not be necessary for the money, but it is necessary for the recognition and for the additional capital to realize more of their visionary ventures. Without that recognition they are “Going John Galt” and refusing to work that hard. Anecdotal I hear it from many if not most of my small business clients. How “small” is their business if they are paying an additional $300,000 in taxes? Jeff, at the end of 2012 there is a tax tsunami coming. Many tax rates are rising, but let’s just look at one. The effective rate on double taxed dividends is going from 44.75% to 65.81% for corporate businesses which pay dividends. Take a look at this article on “Double-Taxed Dividends: Going Up” by Austin Johnston. If a business with $1,424,501 in corporate profits paid out in dividends gets taxed at 44.75% it will pay $637,464 in taxes. At a 65.81% rate it will pay $300,000 more or $937,464. The worst part about these tax rates is that the liberals and media keep saying that the current rate is only 15% completely ignoring the 35% corporate tax rate. Perhaps you think that $1.4 million is a huge amount of money, but for a family-owned business it is not. Small cap is anything less than $1.4 billion. Micro-cap is less than $300M in capitalization. And nano-cap is less than $50 million in capitalization. At $50 million in capitalization, a $1.4 million revenue would be less than a 3% return. 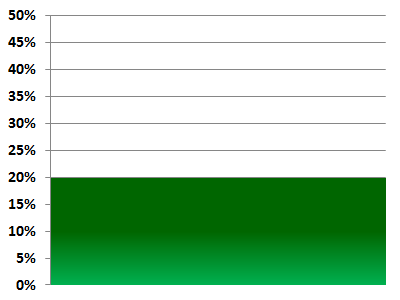 And to only keep $487,037 (34.19%) would be a return of less than 1%. The article is informative, to a degree. It shows the maximum taxes paid, ie worst case scenario. Now, let’s argue the point with the most likely scenaios, ie a business paying much less than the 35% tax rate and a tax payer who pays 15% or 25% on his top income. The end result of the ” tax tsunami” is not nearly as bad. Now comes the question of why companies pay dividends. Generally this is done because a company can’t figure out a better use for the dividend money, like putting more money into the company, for expansion for example. No one is forcing the company to pay those dividends. Companies pay them now because they are taxed at such a low rate. The low rate on dividends allows mostly wealthy people, that’s who receives the most dividends-right?, to pay inordinately low overall tax rates. Not good for anyone except the wealthy. Your example of a business making a “corporate profit” of $1.4 million just shows that my view of a “small” business is much different than yours. $1.4 million profit may be a nano cap on Wall Street, but I don’t live there! US economist Paul Krugman has characterised the Tax Foundation as “not a reliable source” while criticizing a report by the Tax Foundation comparing corporate tax rates in the United States to those in other countries. Krugman has also accused the Tax Foundation of “deliberate fraud” in connection with a report it issued concerning the American Jobs Act. This is from Wikipedia. Krugman has a nobel prize in economics, as you probably already know. (1) Why would you suggest the most likely scenarios is a business paying much less than the 35% rate? Perhaps in your world there are no small business owners getting hit with tax tsunamies, but that’s the point, isn’t it? You don’t meet the payroll of two dozen workers to support their family’s livelihood. You aren’t hiring to help alleviate unemployment. The larger small business owners are. This *is* the world where we live as we work with small business owners helping them run their financial affairs. And from my experience when you have over $388,350 in profit you are in the 35% federal tax bracket. Period. There is no magic way to avoid that tax or pay less. With all the other taxes thrown in the top marginal rate is usually about 50%. So if you have $388,350 in profit you get to keep about $250,000 for lifestyle, savings and any new investments. This isn’t the ultra rich. (2) What kind of country are you suggesting that would penalize companies returning to shareholder their share of the profits in dividends? It used to be that the entire reason to hold stock was if you purchased a share for $14 and it paid a $1 dividend you could be able to save and invest in stock and live off your share of the profits in the corporation. Now you want to encourage a world where profits should never be paid in dividends, you should just keep rolling those profits back into capital growth. But if a company can *never* effectively pay its profits in dividends, then less people would want to invest in it. The reason the stock price goes up is because they are earning more that they *could* pay in dividends. Would you buy a farm which *never* sold any of its produce, it just kept planting more and more of the seeds back into the ground. That works for a while, but then you want all that planted ground to actually start paying dividends that you can live off of either by eating or selling. (3) Respectfully, I have not been impressed with Paul Krugman’s economics despite his 2008 award. krugman is the John Maynard Keynes of this generation. He is the most heavily quoted economist by politicians seeking to justify increased spending. Milton Friedman is a much better respected economic perspective. The debate is over the definition of tax rate. If tax rate means the average rate then in my example the average rate of the first tax code is 10%. No one is actually paying the 100% marginal tax. It discourages higher productivity so much it keep the effective tax rate low. So for you to argue that the marginal rate is “deliberate fraud” is ridiculous. I wrote the entire article to try to explain the difference and show that the average tax rate could be low, and yet by lowering the top marginal rate you would collect more in taxes and stimulate the economy. This is because: ALL DECISIONS ARE MADE AT THE MARGIN. I am also amazed at how small a business you can be and still be hit with these top marginal rates. Gathering after tax resources to make capital investments in new ventures (which cannot be written off) is extremely difficult and slow with these rates. (4) But back to the point, it is simply a fact that the United States HAS the top margin corporate tax rate. If so few businesses are actually paying it, you ought to favor increasing the lower rates (that they are paying) and decreasing the top rate you say they aren’t. But to argue that the top marginal tax rate doesn’t matter somehow is ridiculous. ALL decisions are made at the margin. Jeff, why are you hung up on “small business”? If a small business has some success because they are pleasing their customers and there is opportunity to grow, then they EMPLOY more people and eventually they cross a threshold where they have enough employees to not be considered “small business.” But who cares. The business and the people are not here to be tax slaves to the govt. If they are successful it is because WE consumers voted with our dollars feeling like they blessed us among all the alternatives. So a biz or a person making more money simply means they blessed more people. Why should they be punished for it.? 100% of America’s success in modern era has been under the progressive tax code. Bush’s tax were progressive and the Obama Administration extended those cuts for the entire first term. You may have a case that flatter is better but not to kill the economy as history has shown. I have faith in the human spirit finding a way to thrive in any horrible condition. As marginal tax rates increase economic activity moves elsewhere either into the unreported economy or overseas. Soviet Russia functioned for many decades on their unreported economy. We haven’t had a high percentage of workers near a 100% tax, but even in that case workers wouldn’t give up and just stop working. They would simply stop complying with the laws that were killing them. Economically the effect of any change would depend on how many workers were at each rate where marginal taxes increased. The top marginal rate is important, but so is the shape of the curve. It also matters what the competition is in other countries who have lowered or flattened their rates. Before the fall of the Soviet Union there was less competition among countries for lower flatter tax rates. Kennedy lowered the top marginal rate from 90% to 70%. Regan lowered the top marginal rate from 70% to 50%. These changes in the tax code at various levels seems to have had a positive effect both on the economy as a whole and also, oddly enough, result in the productive paying an even higher share of taxes. This suggests that economic activity was being truncated. It also suggest that the effect of the top marginal rates rising at the end of this year could truncate economic activity again. Corporate taxes should br flatter i agree with Romney that it should go from 35 to 25%. I am not so much in agreement with individual taxes. My definition of tax fairness is balancing out the taxpayer whose livelyhood yields them cash for having cash versus the taxpayer whose livelyhood yields them interests on payments for lack of cash. Progressive tax in that scope, to me, is fairer. Although I’m not sure exactly what it means to “balance out cash” it sounds like the ‘fairer’ you seek is an equality of result rather than an equality of process. As you do that you destroy incentives. Those with a conservative view (Tragic or Constrained) seek to build system which have the right incentives. These types of systems have infragility. The more you knock them out of balance the more negative feedback and incentives move then back into balance. Did you watch FoxNews on Monday? Bill Kristol says that the best economic years were between 1983-1986 under Reagan and that the marginal tax rate was then 50%. He says caving in to Obama’s millionaire tax hike from 35 to 39% is ok because it beats the best economic years under Reagan’s 50% tax rate. A complete shocker. I found the video on Youtube for you to review here. What is your comment to that? Between 1983-1986 the United States had a relatively lower top marginal tax rate globally. Since the fall of the Soviet Union (thanks Regan!) countries have come out from under oppression and competed in the market place. The top corporate tax rates of OECD countries have dropped consistently since then leaving the United States behind. Very good David. It is all too rare that people understand that government revenue is the product of the tax rate times the frequency at which that rate is levied. Many a small businessman is constantly faced with taking company income as profit or using it to buy equipment or to expand facilities. It the tax rate now is high on profits, he will favor the equipment and facilities investment in many cases, especially if he is convinced that will grow his business and he can take more profit from his business when his wife has retired or his own income has dropped still more with semi-retirement. Or, he may simply defer profit because he believes Romney will lower taxes below those now faced under Obama. Thanks David, I agree I think, although it’s a little over my head, At this point I would love to see a simple flat tax instituted, but that would eliminate people like H & R Bloch and Jackson Hewitt, and bring housing prices back to earth , but what a shock it would be.!! The ultimate reality check..!! Tax rates in 1920 topped out at 73%. By 1923 the top rate was 58%. By 1924 the top rate was 46%. in 1925 the top tax rate was 25%. By 1930 we were in the middle of the Great Depression. Tax rates are lower now than they have been in the last 20-30 years. So where is all the economic growth that is supposed to follow these lower tax rates? Lower top tax rates only mean that the rich get to keep more of their money and evidence proves that in the last 30 years the rich now own a larger share on wealth than at any other time in U S history, except for just before the Great Depression. Corporations, while seemingly taxed at 35%, rarely pay this amount. Look at Exxon-Mobil or GE or many more corporations who regularly pay less than 5% or 10%. Lowering the top rate to 25% would mean they would pay even less! How does this help the economy? You are throwing out numbers and questions as though they are reasoned arguments. This may be emotionally compelling, but economics works differently. Let’s see if I can point you to some better reasoning. (1) Remember that government revenue is the product of the tax rate times the frequency at which that rate is levied. The whole point of the article is that all decisions are made at the margin. Looking at average tax rates isn’t what is important. Neither is the top marginal rate. The important aspect is how many companies are at a marginal rate which is not competitive with the marginal rates available in other countries. (2) In the 1980s the United States lowered our corporate rates making them competitive. But after the fall of the Soviet Union and millions coming out from under Socialism the global landscape has become much more tax competitive. The US Corporate rate remains far above the Organization for Economic Cooperation and Development (OECD) average. Even high tax European countries have lower corporate tax rates than the United States. 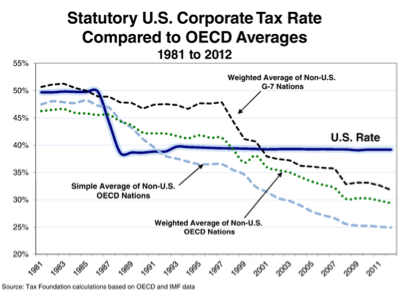 Take a look at this graph of U.S. corporate tax rates vs. the world (OECD). (3) Your facts about America’s biggest corporations paying little corporate tax is from Alexander Eichler’s Huffington Post article and others like it or citing it. During the first quarter of this year, our U.S. operating earnings were $2.6 billion. The rest of our earnings – more than $8 billion – came from operations in more than 100 countries worldwide. Here’s a number you won’t hear in Washington: During the first quarter, on those U.S. earnings of $2.6 billion, we incurred tax expenses in the United States of $3.1 billion. That’s right – our U.S. tax bill was higher than our U.S. earnings. That includes income taxes, sales-based taxes and others such as property taxes. But it doesn’t include royalties or lease payments we pay to the government to produce oil and gas on government-controlled lands, which would make the government’s take from our operations even bigger. As strange as this might sound corporations making profits IS the economy. How does removing all that capital from the economy in the form of taxation help? “(1) Remember that government revenue is the product of the tax rate times the frequency at which that rate is levied. “. A 10% tax rate times 100,000,000 equals revenue? What does this mean? Government revenue is the total amount of money paid to the government through all forms of taxes and fees. Period. My point in the first two paragraphs is to point out a striking similarity between tax rates preceding The Great Depression and tax rates preceding The Latest Great Depression ( Recession). As another curious similarity, the Republicans controlled the Senate, House and Presidency from 2001-2007. The last time the Republicans held all three for more than 2 years….just before The Great Depression! Lower tax rates do not lead to national prosperity. Those who forget history are doomed to repeat it, which is what we have done. And just like the last Depression, it will be years before we recover. Show me a chart of actual corporate taxes paid by percentage. That would be much more useful. If Exxon-Mobil paid more in taxes than they earned every quarter, how would they stay in business? So in one quarter of one year Exxon-Mobil paid a ridiculous tax. How about the previous 5 years? How about the numerous other companies that either have paid very little in taxes or even received government rebates in the last 5 years? Companies make money by selling goods and services. The more money average people have the more they can spend. Paying lower taxes has little to do with companies making money, unless you want to use your 100% tax rate example again. What would do the economy more good- 1000 people having an extra $1000 or 1 person having an extra Million? What do companies do with their extra profits from lower taxes? Pay their executives and board more! All hail the rich! Mitt Romney-Believe in America……..but send your money to Switzerland or the Caymans! Jeff, your post adds very little to a rational debate. (1) You aren’t taking the time to understand that the frequency at which a rate is levied is proportional to the negative feedback the rate provides. In the extreme, a 100% marginal tax rate is levied very infrequently producing a lower average tax rate. Your “striking similarities” sound more like the fringe of conspiracy theory than a rational economics discussion. (2) Again you ask for a chart of actual corporate taxes paid which is irrelevant. It might be more useful in supporting your opinion or it might not, but it would not be more accurate. The 10% rate paid fails to show the effects of the top marginal tax rate of 100%. And ALL decisions are made at the margin. The point from Exxon-Mobil was in response to your citation of articles claiming that the top corporations paid very little tax. I took Exxon-Mobil where the claim was that they have paid a tax rate of less than 2% and showed that that accounting was taking US Federal taxes paid divided by Global Revenues. It was to show that your assumption that corporations aren’t paying the 35% rate is incorrect. Many of the pico-businesses we work with are paying the 35% rate of tax. Your statement, “Paying lower taxes has little to do with companies making money.” is simply wrong. Imagine I own a business with three locations and I want to open a fourth. Investing the capital expense is not deductible, it has to be written off over many years of depreciation. So I need to get that capital after paying taxes. Capital is just deferred consumption. But to get that capital after taxes I have to pay the taxes first. Now imagine that the capital requirements are $1.2 million and I’m earning $400,000 each year. Without taxes I can live off $100,000 and save the remaining $300,000 each year for 4 years before I can open a new location. But with a 50% tax rate I can live off $100,000, pay $200,000 in taxes and only have $100,000 each year for the next 12 years before I can open a new location. Taxes matter and they matter a great deal for the growth of the economy. You sarcasm comments about “Paying their executives and board more! All hail the rich!” shows how easy it is for envy and covetousness to turn into resentment and wishing them ill. What you don’t realize is that while income disparity is large, lifestyle disparity is much much smaller. Those with the highest incomes do not live lifestyles that are much higher than middle class. They put most of their investments back to work in just such productive expansions as I outlined above. When you don’t let them keep their income they don’t change their lifestyles. But they do have less capital to use for future investments. You also make the mistake of assuming that money paid in taxes is somehow better than money kept by productive entrepreneurs. It is as though you would be happier if the money was burned than allowing company owners to use it. Finally, you make the mistake of not understanding what it mean that foreign taxes were paid by Mitt Romney. Foreign taxes paid does not necessarily have anything to do with offshore accounts. It has to do with global investments. If you have any allocation to foreign companies in your portfolio, you probably paid foreign tax as well. If you held those investments in a taxable account, you can deduct these taxes paid. These deductions are to avoid marginal tax rates exceeding 100% in a highly progressive system. I’ve paid foreign taxes every year since owning my first mutual fund as a teenager. I’m going to approach this from a different perspective, and I think it’s appropriate given the apparent class warfare that’s taking place in this country. Looking at this as a moral issue, I find illegitimate rationale in favoring a progressive taxation system. Supporters of the system claim to be for fairness, but how is that defined? What percentage of taxation is fair for someone earning $1 million versus someone earning $50k? Depending on who you ask, you’re going to get a different answer, and I’d bet the most common one would be “I don’t know.” When you focus on the outcomes, you start analyzing all the “what ifs,” performing all these calculations and trying to figure which one is the most fair. It is an impossibly opinionated and gray area. There is really a simple way of looking at it if we just remember that we all have equal rights. Anytime the government demands a greater proportion of income from one person over another, it is in effect saying that that person has less of a right to their property than the other. This violates the principles of our Constitution and Declaration of Independence. Of course, the income tax itself succeeds in this because it forces you to pay the government before you earn anything; otherwise you’re incarcerated. The point is, there is no moral consistency in deciding the degree of progressive taxation. If we really do value equal rights, it shouldn’t be difficult to recognize that any progressive (or regressive for that matter) tax is a violation of that equality. You are right to aim at the moral argument. Free Enterprise safeguard lasting happiness, promotes real fairness, and does the most good for the most vulnerable. Every dollar should be treated equally no matter who is earning it. Why should a dollar earned by a man living with a rich woman be treated differently than a dollar of a man married to a rich woman? For that matter, why punish the productivity of a rich woman who wants to produce another dollar of productivity more than a woman who wants to earn her first dollar? A flat tax (such as the tithe of 10% in the Bible) produces a system where the king can’t manipulate the tax code to reward his friends and punish his enemies.